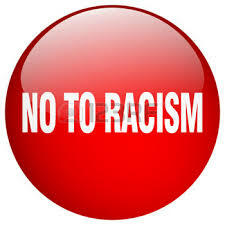 STOP THE RACE SUPREMACY & RELIGIOUS BIGOTRY POLITICIANS IN MALAYSIA AND ABROAD URGED! CASSA MALAYSIA is in shock, sadness and grief with super disgust at the murder of 49 Muslims at prayer in their Christchurch New Zealand mosques. 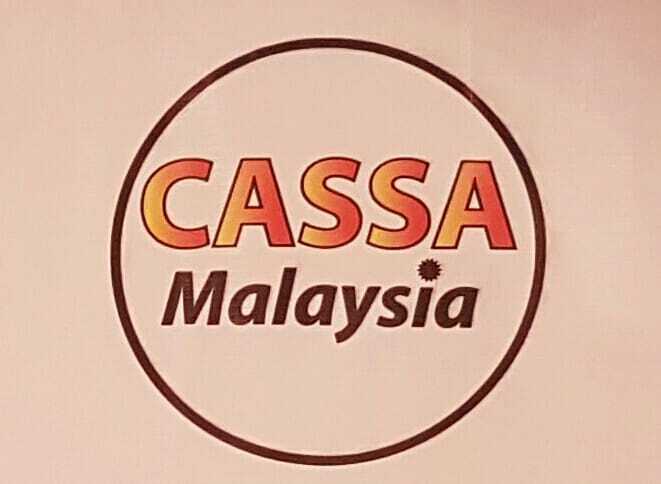 CASSA MALAYSIA grieve with our Muslim brethren and their families in New Zealand and with all communities spearheading peace, love, moderation and goodwill! We remind all parties, most importantly, head of states, politicians, religious leaders, men and women of faith that hatred, race and religious baiting and intimidation and talks of supremacy and its seeds thrown in that direction has never solved anything, from time immemorial and has no place in this world of ours! 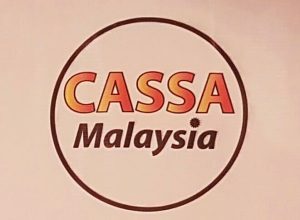 CASSA MALAYSIA join in solidarity with people of all faith and goodwill everywhere to confront and stand against hate, violence and the theology of religious and racial supremacy in all its forms. 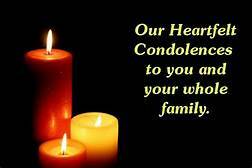 MAY THE ALMIGHTY HELP US ALL! 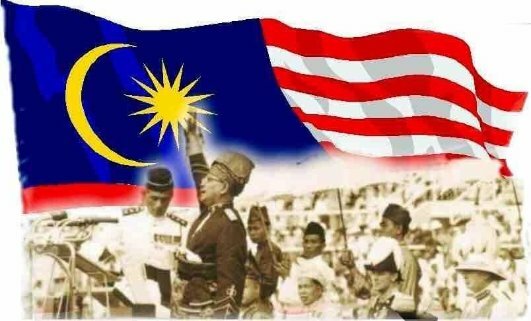 The best form of idiocy, stupidity, incompetence, lack of professionalism and fear comes forth when Malaysian policymakers are caught out in ‘double speak’ when facing a challenge and this is no different! They love the honorifics, the perks of office, the ‘syiok sendiri’ attention from the media, which all gives a false sense of importance until they are caught on record making statements that are really stupid and foolish! It reminded me of those early days, after we lost MH370 (9M-MRO) when we have numerous political, civil service operatives, the security apparatus and corporate personalities falling over each other with their incompetent communications minders trying to protect them from hard questions from a well-oiled and war zone prepared international media group as they made statements after statements that made no sense which is confirmed today – March 15th 2019! Some are still at it today thinking they did great? 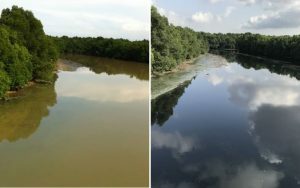 Now we are faced with a major man-made disaster, (pix 2012 & 2017 above from Johor Malaysian Nature Society) which has impacted an Industrial area called Pasir Gudang in Johor with actual figures changing depending on who you are speaking to! But first let us state the facts! 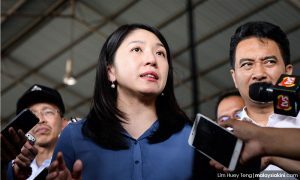 On 13 Mar 2019, was there a statement made by Energy, Science, Technology, Environment and Climate Change Minister, Yeo Bee Yin that one of three men suspected to have dumped chemical waste in Sungai Kim Kim in Pasir Gudang is to be charged in court the next day? 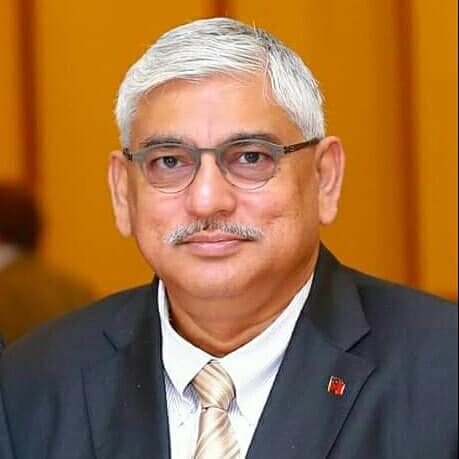 That she has been in contact with attorney-general Tommy Thomas on the possibility of bringing multiple charges against the suspect due to the serious nature of the offense and inadequacy of the penalty. We are confused as today Police have denied arresting any individuals in relation to suspected toxic waste dumping in Pasir Gudang. 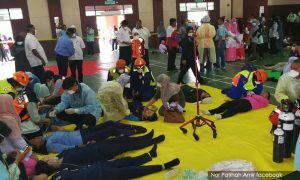 This was after being asked about previous reports that three individuals had been arrested over the toxic pollution in Pasir Gudang. So if there has been no arrest, can the said minister of Energy, Science, Technology, Environment and Climate Change, please go on record and clear the air! 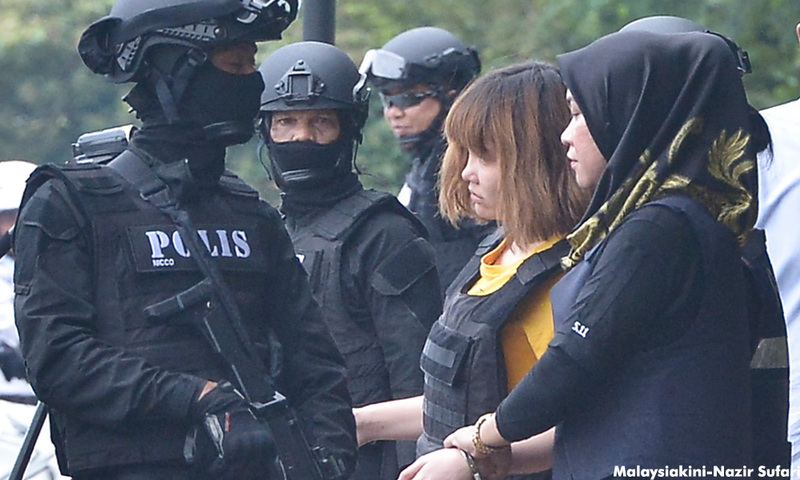 If no one has been arrested, charged to date, why talk about that upon conviction, the person can be sentenced to a maximum of five years’ jail and fined RM500,000 under Section 34B of the Environmental Quality Act 1974 and so forth? This is no laughing matter as public interest demands accountability and good governance to be the order of the day let alone the need for information and updates released being truthful and not the figment of some politician’s mind games or imaginations! It is super serious because the Johor state government has approved an emergency allocation of RM6.4 million to clean up Sungai Kim Kim in Pasir Gudang. The work will involve cleaning up a 1.5km stretch of the river that has been polluted with chemical wastes! That is not all, as my beloved Sultan of Johor, Sultan Ibrahim Sultan Iskandar has pledged RM1 million to help the authorities address the chemical pollution crisis in Pasir Gudang. 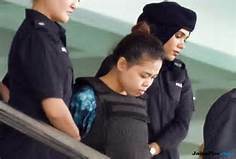 The seriousness is highlighted when beloved Johor Permaisuri Raja Zarith Sofiah Almarhum Sultan Idris Shah has waded in on these issues concerning the community stating that the contribution from Sultan Ibrahim would enable rescue agencies and authorities involved in operations to arm their respective teams with the necessary equipment. 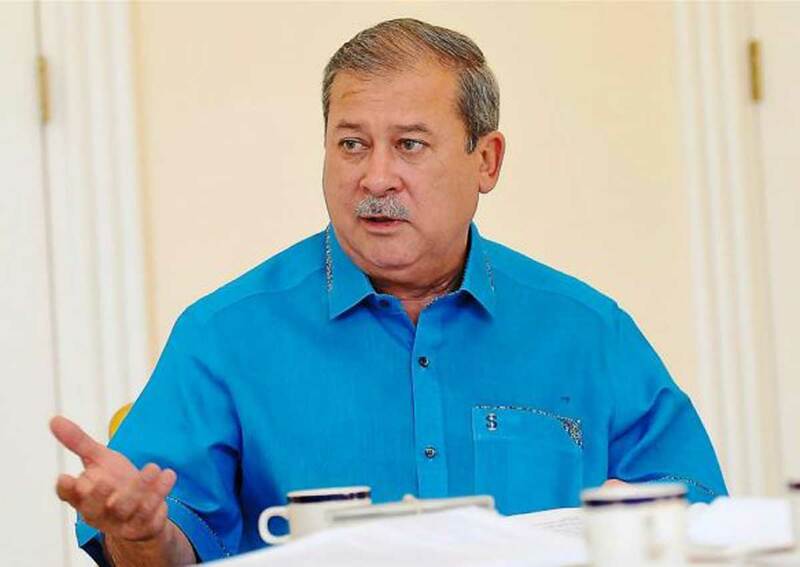 One should also bear in mind that in a previous statement, Sultan Ibrahim expressed unhappiness at irresponsible parties who dumped chemical waste into Sungai Kim Kim, adversely affecting students and members of the public. He wanted the authorities to conduct a thorough investigation into the incident and to take firm action against those involved. This comes as there are voices calling for an emergency to be declared with the politicians reluctant to initiate! In response, Energy, Technology, Science, Climate Change and Environment Minister Yeo Bee Yin said she has no power to unilaterally declare an emergency, but promised to forward the matter to the committee in charge. 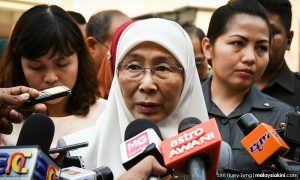 But, Deputy Prime Minister Dr Wan Azizah Wan Ismail says that the government will evaluate the extent of the situation at Pasir Gudang in Johor first before deciding on the need to declare a state of emergency, lest such a move leads to a wave of “panic attack”. Prime Minister, Dr Mahathir Mohamad stressed that there is no need to declare an emergency in the wake of the Pasir Gudang toxic chemical waste pollution crisis, after visiting Johor as the situation was under control according to feedback given him by others? 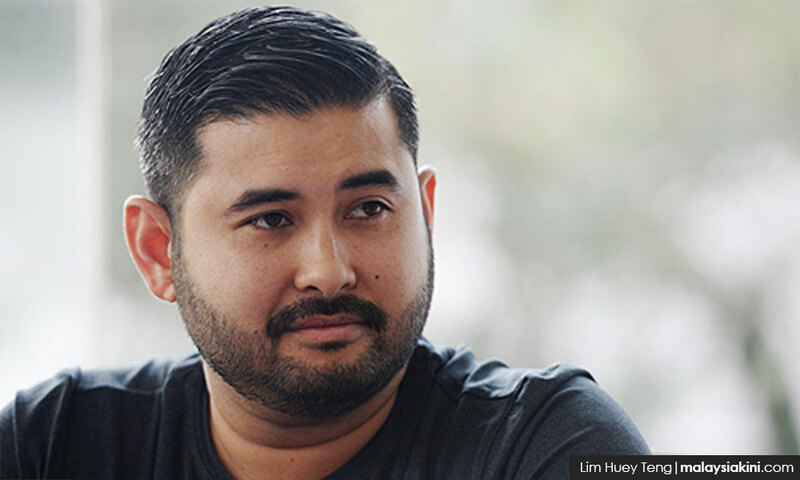 But HRH the Crown Prince of Johor Tunku Ismail Sultan Ibrahim is shocked that the government is not declaring an emergency in Pasir Gudang over the chemical waste pollution incident. 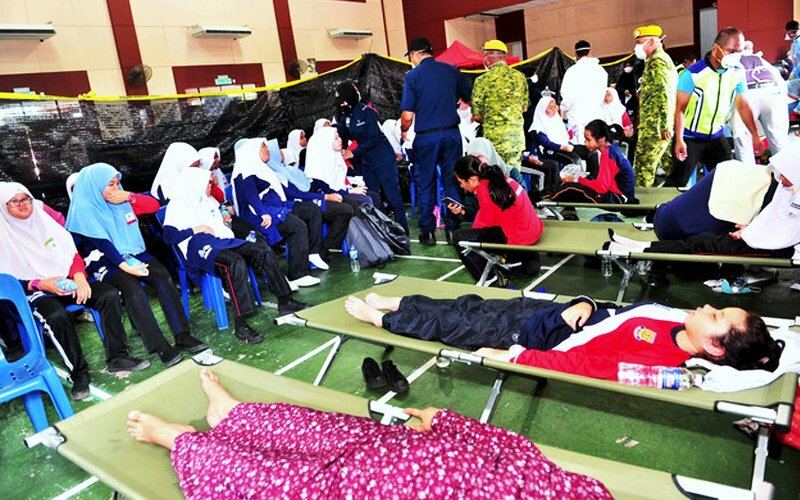 Tunku Ismail said the government should at least evacuate the people in the affected areas until the situation becomes stable and safe. And he is right, as there are more than two thousand people affected and an emergency initiated will facilitate both a national and if needed an international response end to end to not just address the present challenges in Johor but similar issues in other states! 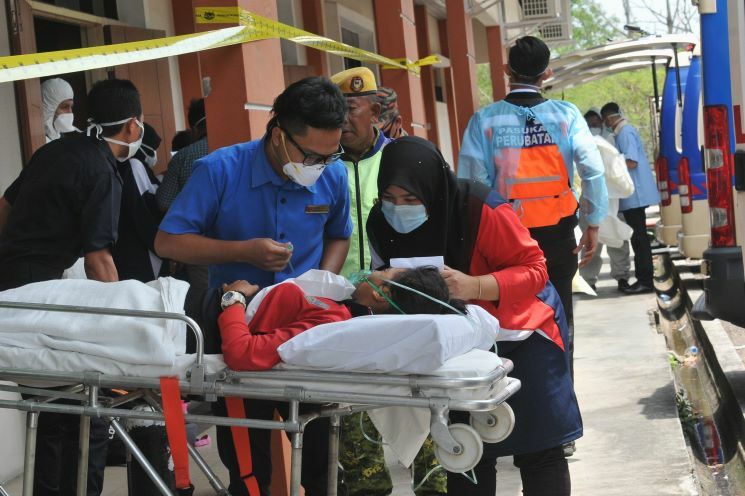 To date, 2,775 people have sought treatment at several hospitals in Johor due to the incident, with seven of them in the Intensive Care Unit. It also led to the Education Ministry directing the closure of all 111 schools in the Pasir Gudang district as a precautionary measure. A total of 92 kindergartens and nurseries in affected areas have also followed suit. I fully endorse an emergency footing as at the end of the exercise, we can have a blue print to launch across Malaysia in regard to regulating the creation process, indiscriminate storing, movement and dumping of toxic materials! A high powered task-force should also be set up to declare war on those involved in the indiscriminate storing, movement and dumping of toxic materials! 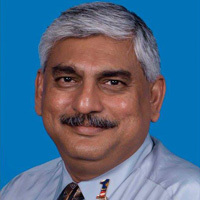 So far this incident which began on March 7 and under the control of various government agencies while in positive engagement needs more bite. 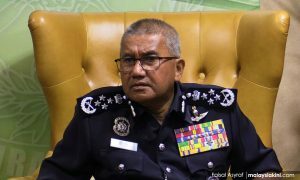 What we are doing is containment but what I will push for is a double response, one containment and the other going on the offensive against the perpetrators and intending perpetrators that this will never reoccur in Malaysia again! For that to happen there needs to be one person in charge – who will be in the center of the process, the optics, making tough decisions no matter how difficult or challenging it is, updating both HRH Sultan Ibrahim Sultan Iskandar and Prime Minister Dr Mahathir Mohamad and from where I stand, I see again as I did during the MH370 (9M-MRO) 2014 saga, there is none! 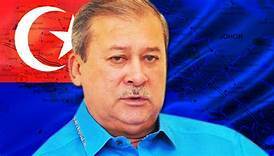 HRH Sultan Ibrahim Ibni Almarhum Sultan Iskandar Al-Haj, the Sultan of Johor (above) as always, very concerned and caring, for HRH’s subjects has pledged a donation of RM1 million to assist with the cleanup! The issue of illegal dumping is not a new phenomenon! As long as I can remember, then as a senior member of both CAP and SAM in Penang from early eighties, it was a major problem! 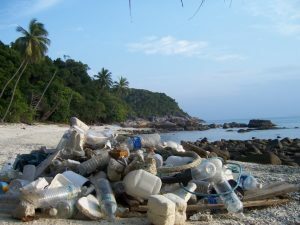 The last time someone counted – Malaysians produced an average of 30,000 tons of waste every day, which I suspect is a rather conservative estimate! But did you know that only 5 percent of it is recycled. Previously, if my memory serves me good, these two statistics were revealed by the then Minister of Urban Wellbeing, Housing and Local Government ministry, my dear friend, Kota Belud MP, Abdul Rahman Dahlan! I remember him sharing with that these two are causing enormous problems for Malaysia. And us discussing how to address this challenge from both a top down and down to up approach and strategy! He was fully committed to bring holistic change! And I fully agreed with him having addressed the same challenge since the eighties! We had failed to recognize the dangers and ticking time bombs in the country’s buildup of solid waste resulting in tremendous land, waterways and air pollution for the environment, health problems for communities and bottlenecks to economic growth. We forgot that taken collectively this problem of poor waste management in Malaysia is one of the nation’s biggest issues to date. In all fairness, we must admit that for decades local and national governments have been trying to curb the flow of garbage onto sidewalks, into landfills, over hillsides and through rivers, but Malaysia’s turbulent pace of change has made that process extremely difficult. The ugly presence of a lack of foresight, dedication, passion, and commitment, zero tolerance for all forms of pollution and incompetence and corruption were the major obstacles! 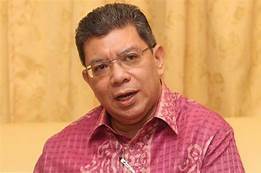 We must admit that population increase of locals, migrants, and foreigners, their set and forms of consumption and disposal rates are escalating faster than Malaysia’s utilities can handle. 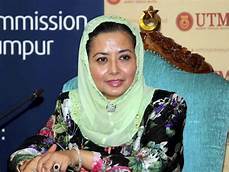 I am advised that in the 10 years from 2003 to 2013, the generation of municipal solid waste (MSW) in Malaysia increased more than 91 percent. Urban development is largely responsible, the country’s city-dwellers (at 65 percent of the total population) being the biggest contributors to waste. 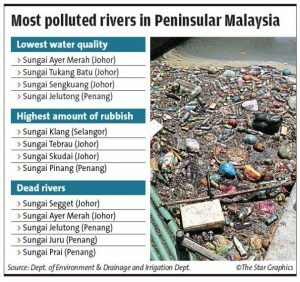 And if we combine this with a metropolitan culture that loves to buy and toss – and an infamously poor public understanding of resource conservation and recycling – and Malaysia has quite a bit of garbage to deal with. Our silver bullet so we thought was landfills? In 2013, about 42 percent of all MSW in Malaysia was incinerated. Two percent was recycled, leaving the remaining 56 percent to be dumped. Were you aware that the vast majority of landfills in Malaysia are open-air pits? Economically this quick and dirty method is cheap, but it destroys our environment! The dangers were that this resulted in surface and groundwater contamination through leaching, soil contamination through direct contact, air pollution through garbage burning (intentional or not), disease spread through birds, insects and rodents, uncontrolled release of greenhouse gases and of course, a very unpleasant odor. As harmful as open-air landfills can be, they are much preferable to uncontrolled dumping, another big issue for waste management in Malaysia. This was not the only challenge as only about 66 percent of rural area populations are covered by garbage services, so a lot of trash ends up strewn over the countryside. Giant piles of illegally dumped garbage have been spilling into rivers for years, rendering some of them unsuitable for any use at all – even after treatment. These piles have recently begun to smolder from within, melting down hillsides and oozing toxic waste into the soil and water that local communities depend upon for farming, fishing, and sometimes drinking water. The main culprits are Malaysians and our throw away culture! Let us be honest by the problem is selfishness and ‘not in my backyard syndrome’! I remember organizing nationwide environmental awareness and environmental education conferences in the 80’s for various demographics in Malaysia! 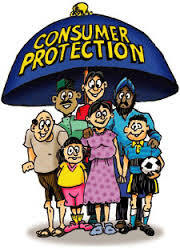 I must confess that these awareness programs, public forums, and dealings with the whole question of corporate responsibility initiatives have failed to make a difference due to poor public response and indifference! There are of course small pockets of strong support for recycling and inspired individuals campaigning for sustainability, but it would appear the predominant take on conservation and recycling in Malaysia is apathetic. Then we have that criminal mind at work where industry players decide to do the unthinkable because of the weaknesses of the Environment Quality Act 1974 and stakeholders both at local and federal levels to monitor and take to task those abusing and violating the EPA! The legislation provides for a maximum jail term of five years and a RM500, 000 fines for breaching Section 34B of the Environmental Quality Act 1974! 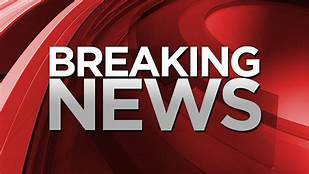 Now can both the state and federal agencies now go on record to state since 1974 how many violators of the legislation have been fined and jailed? If this is not enough a challenge we have great minds importing other idiots waste from countries such as New Zealand, Australia, and the United Kingdom! Yes, we are the dumping ground for these! The alleged reasoning behind the relocation was because it would be “easier and cheaper” due to geographical location, but most importantly, because Malaysia had “loose regulation”. My foot just “loose regulation” – let us be honest! 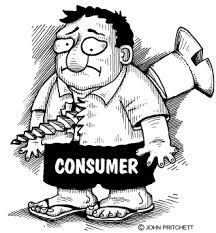 I am certain enforcement officers and stakeholders have been compromised! I say this because it is far too much of a coincidence that the illegal factories are closed when Department of Environment (DoE) conducts their raids! 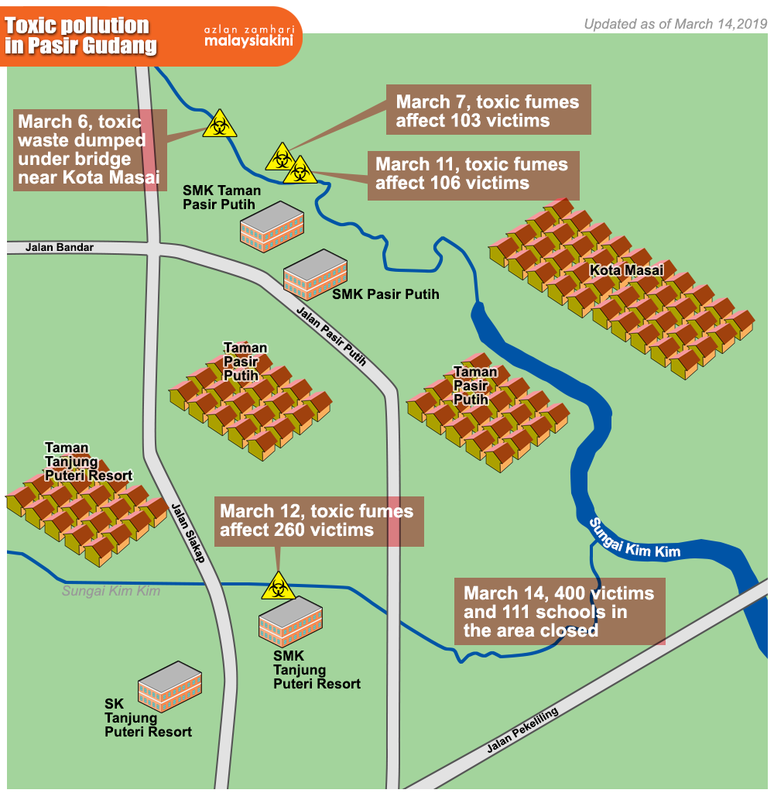 Today Pasir Gudang, in Johor is a district hit by toxic chemical pollution! There are more than 254 chemical factories within the Pasir Gudang area! In many parts of Malaysia, there are also illegal factories operating visible to all and sundry! This latest crisis is alleged to be the handiwork of three men already detained in relation to the chemical dumping, including the owner of an illegal tyre recycling factory in Kulai and the owner of a waste processing factory in Pasir Putih! Now both the state and federal government have gone down to ground zero! Our Premier Dr Mahathir Mohamad has personally arrived at Pasir Gudang – where toxic pollution from Sungai Kim Kim has affected hundreds of people and led to the closure of all 111 schools in the district – at about 6pm today. The prime minister arrived at the Senai airport at 5pm. He visited victims hospitalized at the Sultan Ismail Hospital in Johor Bahru! HRH the Johor Sultan as always, very concerned for HRH’s subjects has pledged a donation of RM1 million to assist with the cleanup! 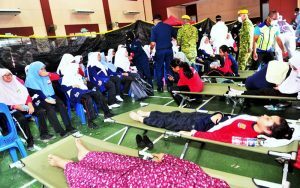 In the meantime, we are also truly grateful to the Johor state disaster management committee, the medical and security teams for handling the challenge admirably! ‘There are far too many foreigners in the country now and many allegedly abusing the social visit or other visa extended! Many are involved in criminal activities as well as illegal collection of donations! There is so much, we do not know about this case! This was never our war! We know that there were prime notorious operatives who escaped the dragnet pertaining to this high powered murder! The very fact that they took flight successfully raises far too many questions! 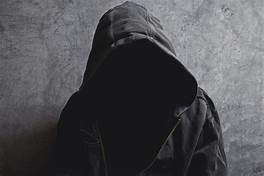 There is so much we know and at the same time unknown, thanks to the world of espionage and counter espionage and the continued abuse of diplomatic immunity! There are many tools being used and games being played and orchestrated for political, religious, race and corporate reasons! But when decisions are taken affecting one defendant, public interest and justice appeals that it be consistent! That is a universally accepted principle! This is not an isolated case, as the world watches, analyses, while others look for allegedly double standards, favoritism, partiality and abuse claims! This case has been an unnecessary diversion and waste of our resources and the use of our security apparatus that should be looking out for closet, sleeper and both visiting and ‘rest, recreation and quickie marriage to locals’ terrorists move and set up ‘shop’ within and around our borders! There are far too many foreigners in the country now and many allegedly abusing the social visit or other visa extended! And where are those donations going to? 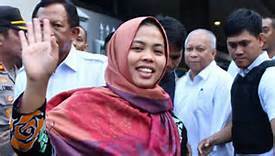 As far as this case is concerned and as a human rights attorney, I record my sincere appreciation to the Government of Malaysia for dropping all chargers on co-defendant, Indonesian Siti Aisyah! But now, let us go further! 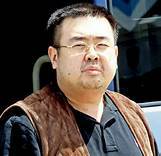 We now appeal that the same mercy be initiated and extended against Vietnamese citizen, Doan Thi Huong in the 2017 murder of the North Korean leader’s half-brother, Kim Jong Nam, with liquid VX at Kuala Lumpur airport in February 2017. 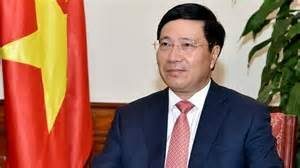 CASSA MALAYSIA supports dear friend Vietnam’s Foreign Minister Pham Binh Binh, appeal to his Malaysian counterpart dear friend, Saifuddin Abdullah, according to reports, going further by seeking that all chargers against the Vietnamese be also dropped! Any one from the world of intelligence analyzing this tragic episode will certainly feel and quite rightly so, that these two women were pawns in an assassination orchestrated by North Korean agents. 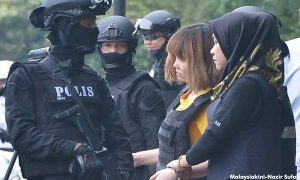 Siti Aisyah and Huong have maintained that they believed they had been hired to participate in a reality TV prank show! Perhaps, what is needed here is mercy extended and closure! The Civil Aviation Authority of Malaysia is suspending Boeing 737 MAX 8 flights to and from Malaysia with immediate effect following two fatal crashes involving the planes. 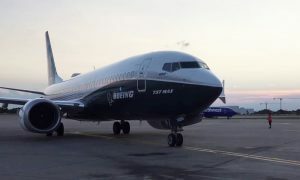 In a brief statement, the authority’s CEO Ahmad Nizar Zolfakar also said that none of the Malaysian carriers operates the Boeing 737 MAX 8.